A couple of weeks ago, I was up in Sheffield and visited their Millennium Gallery. 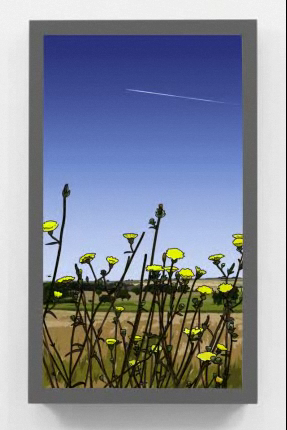 The gallery is currently showing a landscape exhibition and one of the works on display which particularly captured my fancy was a continuous animation by Julian Opie. I thought I'd share it on my blog as those of us in the northern hemisphere begin to anticipate spring. It particularly spoke to me as it conjured up memories of one particularly idyllic mid-summer's day in 2009 when I took the picture below, as I lay in a meadow with my mum and The Cat, taking a wee break from a drive through Oxfordshire. When I did my research upon getting home, I discovered it is called the Bliss Valley Tweed Mill... Perfect, no? Here's to art, photographs and treasured memories that keep summertime bliss alive all year round. Thanks, Sally. This weekend's snow has made it especially useful to be able to retreat into art and memories for some warmth. When, oh when, will spring arrive again! I just looked at the link to Julian Opie's animation. Lovely, mesmerising! And the bees :) Of course, I started to investigate further. The "Evening Star" animation is beautiful, especially as it has a flock of birds in formation such as I love when we see wave upon wave of them here. They fascinate me. Thank you, Miss Marie. I'm going back to look at more in his "book". Glad you were encouraged to have a look at his work - and have been enjoying it. I wonder if you could find a photo of birds to match the Evening Star as I found a photo to match Jetstream?! Now there's a challenge - and I think I can answer it with one of your own photos! And I think I know what you're talking about but I'll have to look them out!